THEY first wowed the world with West End Girls . . . and now the Pet Shop Boys are set to become stars of ballet. 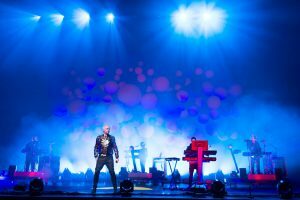 Neil Tennant and Chris Lowe have already produced 10 studio albums, penned a musical and written a silent movie score during a music career spanning more than 30 years. But next month the pair will see the fruition of their most ambitious project to date . . . a ballet opening at London’s Sadler’s Wells. The duo – including Tennant, a former pupil of St Cuthbert’s High School, in Newcastle – have spent more than three years working with dancers, choreographers, a playwright, costume designers and artists on The Most Incredible Thing, a ballet based on the Hans Christian Andersen fairytale of the same name. The boys, famed for hits including Suburbia and Always on my Mind, read the fairytale and joined up with the ballet after realising how ideal the story would be for the stage. The book itself is a three-page tale about a king who decides to give his daughter and half his kingdom to the person who can make the most incredible creation. And his request prompts his people to craft all kinds of ridiculous objects. The winner creates a clock which shows beautiful scenes as it strikes each hour, but just as he’s set to claim his prizes a villain comes along and destroys it – something which the king says is even more incredible. However, just as it looks like the villain will win the prize, the broken figures inside the clock comes to life and save the day. On March 17, a three-act ballet including their score, backed up by film projections and a 26-piece orchestra, will open at the London theatre. Neil said: “What we wanted to do was a narrative ballet with the sort of structure of a Tchaikovsky ballet but with contemporary dancing. Last week Sir Paul McCartney announced plans to work with New York City Ballet on penning the score for their new production Ocean’s Kingdom.